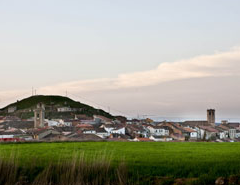 Gumiel de Mercado, in a wonderful setting in Ribera del Duero, has always been a town with a wine-growing tradition. Its structure is medieval and in the town center there is a hill where our ancestors dug underground cellars to keep their wines. This project began in 1999 when we took over the family vineyard and planted new plots. In 2003 we built the winery and began making our wines. The result of this project, with all its work, effort and excitement, has been ARROCAL – our passion. The construction of our winery was completed in 2003. It is an area provided with the latest technical advances designed above all to show maximum respect to our treasure: our grapes. All wine-making tasks are carried out using gravity, with gentle destemming of the grapes, which come in harvest boxes and, after passing over a selection table, are moved by gravity into our 16,000-litre stainless steel tanks. We ferment a maximum of 12,000kg in each tank. We have an automatic temperature control system using showers, so that we ferment at the temperature required by each point in the wine-making process. Medium-length maceration to seek the maximum expression of the fruit and gentle pressings using a small-capacity press. We have a 600-barrel aging unit, with 80% French oak barrels and the rest in American oak, where our wines grow for the time they need to give them structure without losing their identity.